A basic process in QCD is the energy loss of a fast parton in a medium composed of colour charges. This phenomenon, "jet quenching", is especially useful in the study of the QGP, using the naturally occurring products (jets) of the hard scattering of quarks and gluons from the incoming nuclei. ALICE has recently published the measurement of charged particles in central heavy-ion collisions at the LHC. A highly energetic parton (a colour charge) probes the coloured medium rather like an X-ray probes ordinary matter. The production of these partonic probes in hadronic collisions is well understood within perturbative QCD. The theory also shows that a parton traversing the medium will lose a fraction of its energy in emitting many soft (low energy) gluons. The amount of the radiated energy is proportional to the density of the medium and to the square of the path length travelled by the parton in the medium. Theory also predicts that the energy loss depends on the flavour of the parton. Jet quenching was first observed at RHIC by measuring the yields of hadrons with high transverse momentum. These particles are produced via fragmentation of energetic partons. 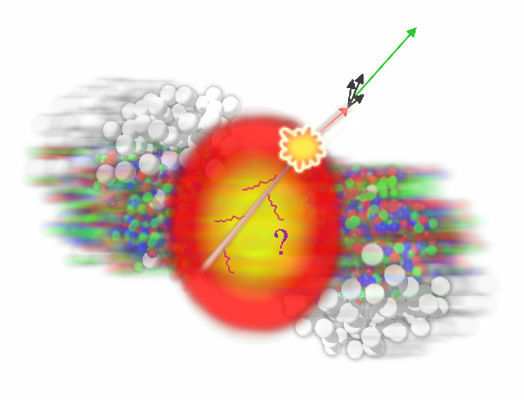 The yields of these high-pT particles in central nucleus–nucleus collisions were found to be a factor of five lower than expected from the measurements in proton–proton reactions. ALICE has recently published the measurement of charged particles in central heavy-ion collisions at the LHC. As at RHIC, the production of high-pT hadrons at the LHC is strongly suppressed. However, the observations at the LHC show qualitatively new features. The observation from ALICE is consistent with reports from the ATLAS and CMS collaborations on direct evidence for parton energy loss within heavy-ion collisions using fully reconstructed back-to-back jets of particles associated with hard parton scatterings. The latter two experiments have shown a strong energy imbalance between the jet and its recoiling partner. This imbalance is thought to arise because one of the jets traversed the hot and dense matter, transferring a substantial fraction of its energy to the medium in a way that is not recovered by the reconstruction of the jets.